AWS Lambda is a classic example of the series of cloud technology products popularly known as serverless or function-as-a-service or FaaS. AWS Lambda is basically a piece of code that runs in an ephemeral container which terminates after serving its purpose i.e. single invocation tasks. Based upon these invocations, you pay only for what you use. Each of the Lambda function is configured based on the memory size (GB) and execution time measured in milliseconds. #1. Memory Size (GB): This is the maximum memory size configuration that you allocate to your function from the AWS console. This isn’t the actual memory which is used by the function. This suggests that even if you reduce your function’s memory usage but do not tweak this configuration, you won’t be able to observe any reduction in the cost. #2. Execution time (ms): This is the actual time that a function takes to execute its code logic. Additionally, for example, if your function is making an outgoing call and is waiting till the response comes, the time spent idle will be also counted in the function’s execution time. The overall duration of the executing functions is calculated from the time your code begins executing until it returns or terminated, rounded up to the nearest 100ms. To calculate the cost of each function, both these values are multiplied together to produce a unit GB-sec. Since GB-sec depends on many factors, it is not predictable. 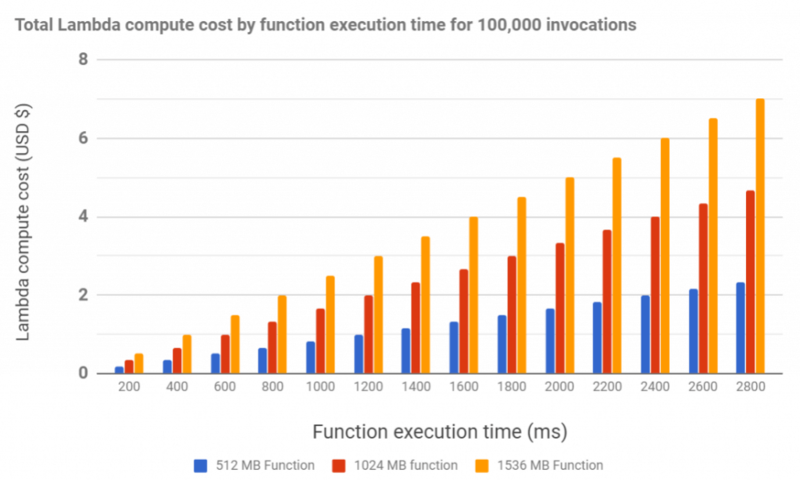 Here’s a chart which demonstrates the cost of executing 100,000 invocations of a Lambda function over the varying time. One must note that the execution time of the Lambda function also depends on the language runtime and 3rd-party dependencies. Image source here. #1. On demand instances aren’t a suitable option. Lambda is designed for functions that are to be executed rapidly after being triggered by the events. To get the benefit of the on-demand EC2 instances, you will have to spin up the container manually each time a function is called. Unfortunately, that would add a tremendous amount of processing overhead and make a function slow. To use EC2 at all you would need your instance to be already available and waiting for the triggering event, which means 100% instance usage per month. This is going to add a significant cost. #2. Your functions aren’t going to run 100% of the time and that’s a backbone which is evident behind Lambda’s pricing model. Lambda works best around and below 3 million function executions per month (source) since you’d want to operate in the range where the free executions that come with Lambda still have a noticeable impact on your bill. However, if your traffic starts getting ahead of 3 million, maybe its time to move to EC2. Before that, consider the next observation. #3. If we observe entirely from the perspective of use cases, AWS Lambda and EC2 have very different implications. As discussed in the above point, AWS Lambda will be a perfect fit for low compute use cases such as serverless authentication, scheduled CRON jobs, chatbots, Alexa skills and more. On the other hand, use cases which will need high compute resources such as real-time audio/video transforming, ETL jobs, etc; EC2 might be a better option. Concluding this, no one size fits all and hence tried and tested approach would be the most suitable. Rewrote an #AWS APIGateway & #lambda service that was costing us about $16000 / month in #elixir. Its running in 3 nodes that cost us about $150 / month. Charges for API Calls: $3.50 per million API calls received. Data Transfer Costs: First 1 GB free then $0.09/GB for next 9.99 TB. For example, a regional API received 5 million API calls per month and each API call returns responses of 3 KB in size without caching. APIs imparts an added value to the serverless functions by facilitating normalize access points for system functions, including security and monitoring. Considering the event-driven architecture, APIs help functions bridge service modelling among the systems by acting as a http endpoints to trigger your functions. API Gateway makes a collection of functions look like a single API developed to meet the specific application requirements. In other language, it consolidates the path to all of the system’s commonly used features in the form of an aggregated service. This approach helps in tackling the load of security, orchestration and transformation of the microservices. It also works as a gateway to forward requests only which are authenticated and authorized. Or as Marco Palladino, CTO at Mashape, explains, “API Gateways works as an abstraction layer that sits on the execution path of every requests that goes to one of your functions.” Saying this, API Gateway definitely plays a critical part of any serverless application, however, the cost implications are pretty high as we discuss about it in the next session. Serverless costs is more than pay-per-trigger. 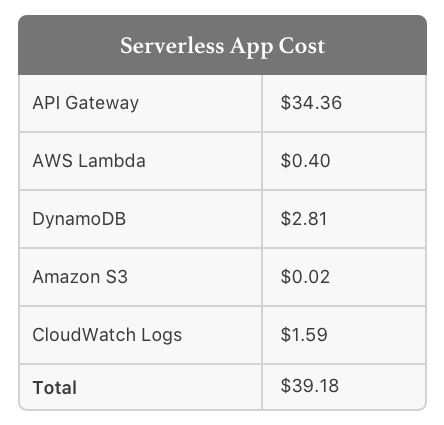 In this section, we will analyze the cost of running a demo serverless application and find out how much AWS Lambda and other services costs in actual. As a demo app, we will be analyzing the Voting App. Here’s the architecture. To understand the working of the Voting App click here. The following app served almost 2 million requests per month. The free tier from all the services has been excluded and pricing are with context to US-EAST-1 region. #2. AWS Lambda: Since most of the compute work is focused on the 60 lines of code that two of our Lambda function executes, this is where I was expecting huge costing. However, it isn’t. Here we have 2 Lambda functions with 256 MB compute memory, serving 2 million requests/month. #5. CloudWatch Logs: The CloudWatch costs for the service coming from logs being sent to CloudWatch Logs and the storage of these logs. 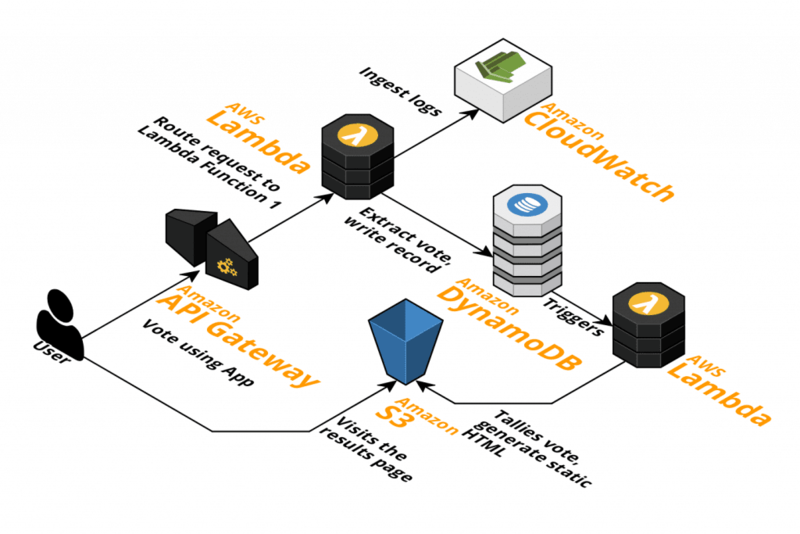 These logs are generated by the AWS Lambda function execution and by API Gateway execution. You can control how much logs you need to generate from AWS Lambda and hence optimize accordingly. What does Serverless really cost? This all comes down to a monthly cost of $50.14 approximately. The striking thing that we observed is that there are more than just CPU & RAM. For most of the people opting for serverless, the major cost drivers would not be AWS Lambda but API Requests, storage and network transfers. #1. API Requests: As discussed in the previous section, it is obvious that our serverless apps are going to be API heavy and its significance is undeniable. This will cost your around $3.50 per million executions. #2. Networking: If you’re sending data in/out, you need to carefully monitor the cost of this. At $0.50-$0.90 per GB-out and $0.1-$0.2 between VPCs/regions on AWS. This has high chances of getting really expensive. #3. Code Maintenance: Serverless coding equals to more lines of code. For each new functionality added to the software system, the number of lines of each function needed to maintain the software’s functionality, grows at a steep linear rate. Since the shared code is an antipattern, each function has to have its own logic. #4. Cold Starts: You may read more about it in our serverless performance blog. Since cold start increases the execution time it is directly proportional to the costing. Additionally, for a startup, an added latency of 100 ms can be a driving factor for users to adopt or discard the product. #1. What is the contribution of AWS Lambda pricing to your total bill? Serverless applications consists of databases, storage, network costs, APIs, data processing systems to name a few. Considering the percentage of AWS Lambda cost to the overall application cost, you will have to see whether it is worth running cost optimization cycles or not. #2. What is your app’s requirement in terms of the performance? Before iterating functions memory allocation for the sake of lower cost, consider this: memory allocation have a significant impact on the cold start and runtime, both of which are directly proportional to the cost. Hence, if your app requires low latency performance then opting for degraded performance at lower cost won’t be a recommended solution. #3. Which and how many of your functions of your app are frequently used? Not every one of your functions will be invoked at the same frequency. Hence, focusing cost optimization for functions with high frequency is recommended, for example, functions having hundreds of thousands or millions number of invocations. How to Monitor the Function for Cost Optimization? AWS Lambda gives a fancy picture of a low cost solution and that is one of the primary reason behind it accelerated performance. However, in spite of the developers keeping a keen eye on the maximum memory size limit and execution time, there are high chances of cost getting out of your control due to a variety of reasons. Some of them are DDoS attack, excess memory allocation or a simple bug in your code bundle. The above record print clearly depicts that the function you’ve executed is just using 50MB out of 1024MB. In such cases, you can save money by allocating 128MB. If you go allocating less memory than this, you function might not execute at all. Why development teams are attracted towards higher memory allotment is because more CPU means faster executions and potentially lower cost. Therefore a recommended solution would be to test and iterate your function’s execution time on different memory sizes. This approach works perfect for the team with the fewer number of functions since monitoring them is easy. On the other hand, since this requires monitoring of functions on regular basis, this will take a considerable time if you have many functions. AWS Console provides AWS Cost Explorer through which you can monitor the pricing of various AWS services over a week, month and quarter. Further, you can classify it based on the region, usage type, tag name, etc. If you have tagged your Lambda functions properly, this will ease your monitoring upto a great extent. You can tally the pricing of your Lambda functions and iterate the changes accordingly. On the other hand, if you haven’t tagged your function properly, AWS Cost Explorer won’t help much. In such cases, what you can do is leverage CloudWatch Alarms to get a notification when a function exceeds the configured limit. Despite the fact that it helps in monitoring the cost of Lambdas, it doesn’t give you the insight on what is actually wrong and where. This helps only in figuring out whether Lambda costs have increased or not whenever an issue occurs. Tuning your executing time and memory size will save you a lot on computing resources and costs. Saying that, it is equally critical to keep a sharp eye on functions that can be optimized by tracking its cost in real time. There are multiple combinations of usage and configuration that affects the overall pricing of Lambda functions. This can be problematic sometimes! There are various factors that affects the invocation frequency of Lambda function. This is based on the triggers. Closely monitor your triggers and see if you can do to reduce the number of invocations over the time. For example, suppose your Lambda function is being triggered from the Kinesis Stream. Since the batch size is quite small, the invocation frequency is pretty high. In such cases, what you can do is opt for higher batch size so that your Lambda function is invoked less frequently. Well, the function that executes in half the time is a function that will cost you half the money. One must note that the execution duration is directly proportional to the amount of money you’ll be charged. Saying that, it is critical to keep an eye on the Duration metric inside the CloudWatch. And it’d be a common sense to modify and iterate your function if it is taking suspiciously long time to execute. For this purpose, you AWS X-Ray can help you monitor function from end to end. While talking about Lambda charges, often times it gets out of our sight that you’ll also be charged for the data transfer at standard EC2 data transfer rates. Hence, it is default to keep an eye on the amount of data you’re transferring out to the internet and other regions of AWS. While talking about internal data transfer, there isn’t much you can do about it as you can’t control the amount of data your Lambda will transfer. Likewise, there is no metric inside CloudWatch which can help you in monitoring the data transfer rate. Keenly monitor your AWS Cost & Usage Report. Filter it by Resource (your Lambda function) and find different values in the Transfer Type column. Further, get the usage amount. This might come off as slightly time consuming. Log the size of data transfer operations in your Lambda code and then configure a CloudWatch Metric Filter as a reference that becomes a CloudWatch Metric. Real-time Lambda Price Calculator: This is a quick and automated way to monitor estimated monthly cost in real-time of AWS Lambda based on your current usage. For more information, you can look here. Memory Metric Filter: This is a simple CloudWatch Logs Metric Filter that can help you in monitoring by extracting memory size and allocated memory from the execution records. Launch Stack here and get started. All that being said, one thing is for sure, mapping out your requirements and how much it will cost to bring your idea into reality, is the first step towards getting started with serverless architecture. No one size fits all! For some organizations, serverless is helping in cutting down cost with a huge margin while others are probably looking for more comprehensive options considering the hidden costs of serverless. Though the notable thing is every serverless provider offers you free tiers which can be sufficient for you for the time being provided you have a smaller workload. Ultimately, serverless offers a huge potential in cost and time saving if done right. Subscribe To Our Serverless Newsletter! 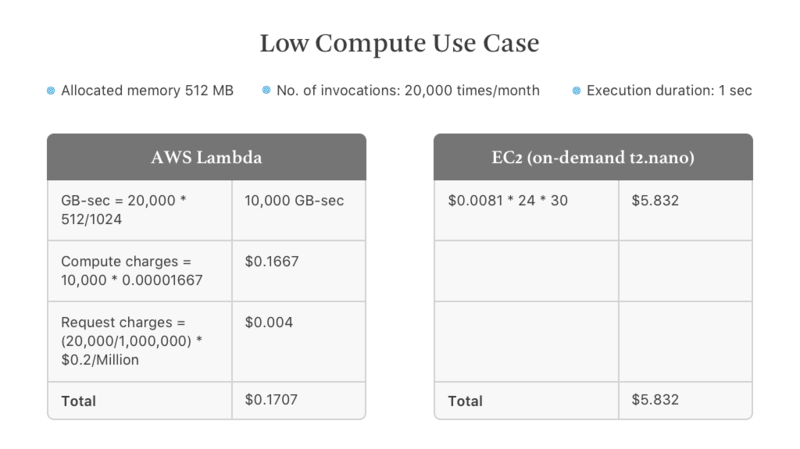 There's more to AWS Lambda (serverless) pricing. Subscribe to receive regular updates on serverless and different cost optimization strategies.